Just before noon, the Associated Press ended almost 18 hours of silence on the arrest of IT staffer Imran Awan yesterday as he was attempting to leave the country. The report spun the news in the most favorable way it could for beleaguered Democrats, making Congresswoman Debbie Wasserman Schultz look like the victim as it headlined her spokesman's claim that she fired Awan Tuesday after learning of his arrest. The fact is that Schultz has been involved in obstructing investigations into Awan's activities for months. Awan, 37, "was arraigned Tuesday in the U.S. District Court for the District of Columbia on one count of bank fraud" and released with an accompanying "high-intensity supervision program." The arrest was reportedly made because there is evidence "that Awan and his wife, Hina Alvi, engaged in a scheme to defraud Congressional Federal Credit Union based on misrepresentations made to obtain a loan" having to do with "written assurances that the home serving as collateral for the loan was a 'principal residence.'" Awan's lawyer is blaming his arrest was "motivated by anti-Muslim bigotry." While the AP's story appears to be accurate as far as what it tells readers, the cause of Awan's arrest appears to have given the wire service a convenient excuse to ignore a huge volume of evidence about Awan's prior activities while working for Schultz which readers deserve to know — and which the establishment press has quite deliberately kept out of its reporting for several months. The justification for the AP's emphasis on Wasserman Schultz's decision to fire Awan as the story's most important topic is paper-thin. Available information reported over several months by The Daily Caller indicates that Wasserman Schultz had ample justification for firing Awan over other matters which will be described shortly for several months. Yet the Daily Caller reported that as of late Tuesday afternoon, in a 5:41 p.m. report yesterday on Awan's arrest, she had not terminated his employment. ... Law enforcement authorities for months have been looking into how Awan may have double-billed the House for equipment like computers, iPads, monitors, keyboards, and routers. Several relatives of Awan worked for House Democrats and were fired months ago. Awan, however, was kept on staff by Rep. Debbie Wasserman Schultz, D-Fla., even though he was no longer allowed access to the House server network. ... Authorities also have looked into IT workers putting sensitive House information on the “cloud” and potentially exposing it to outside sources. ... Meanwhile, the counsel for Wasserman Schultz, the former Democratic National Committee chairwoman, recently began negotiating with (U.S.) Capitol Police for access to her laptop in the case. Until this point, she had resisted USCP efforts to look at her computer – even suggesting “consequences” for the agency if the computer was not promptly returned. ... Awan is of Pakistani descent, and Democratic sources have argued the family’s ethnicity is a factor in the attention they’re receiving. That Awan and his "Brothers Had Massive Debts, Years Of Suspicious Activity"
How "Wasserman Schultz Threatened (a) Police Chief For Gathering Evidence"
How "Dems (were) Tying Themselves Into Knots To Ignore Criminal Probe"
How the "FBI (eventually) Seized Smashed Hard Drives From Wasserman Schultz IT Aide's Home." 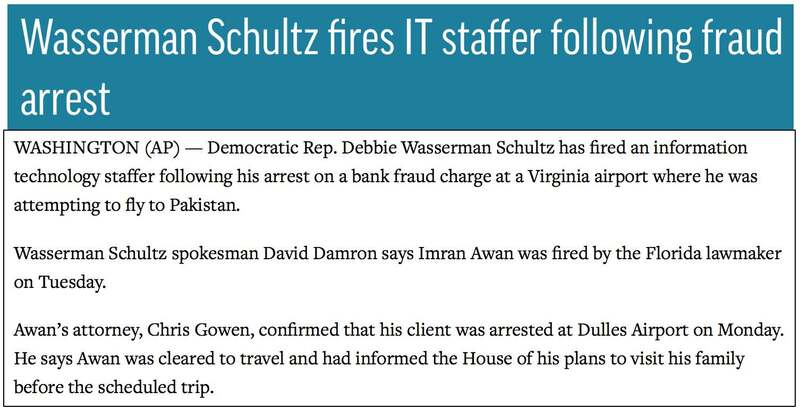 That the AP's initial and quite tardy dispatch on Awan's arrest was written to protect Wasserman Schultz and the Democratic Party could hardly be more obvious.